I'm still new to photography... I don't 'get' this? :-/ I certainly won't take off for me not understanding. I really like this shot and the way it's cropped. if it was better camera - lower scores i would give you +4 more points. Without the title there is no irony here. I hope you get better scores in the future! I get it!!!..... I'm giving you a 10 just to prove a point!!!! Oh, wait, that would be playing right into your whole point! DOH! The title obviously conveys the irony, but who cares? a very nice pic, and an idea very close to a friend of mine. (same camera, lower scores). 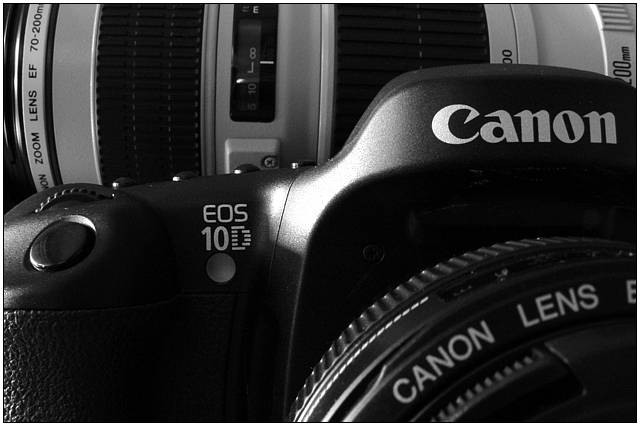 Did you use the 10D to take the photo? If so, how? I think I get it. You got a better camera and are getting lower scores? sad. Way ta rub it in.. drool..... Nice shot and good interpretation of challenge topic. I dont get the irony in this one? You obviously take pretty good pictures with your 'other camera' too - this is very nicely shot and lit. Almost wonder if the colours would have helped add some focal points. It's not the equipment, it is the one holding it. I like the framing, but the hot spot in the middle, i find very distracting. Great lighting, good detail, I like the B/W, Good lens backthere. Aha! Finally a pic with irony... and a good one, at that! Good job! Excellent camera, wonderful lens (which I'll also have in 5 more weeks). The crop is very good - 8. Proudly hosted by Sargasso Networks. Current Server Time: 04/24/2019 12:14:33 PM EDT.